Genesys Logic's single-chip GL125 is a high speed, high performance, low cost and rich scalability controller for bus power scanner. 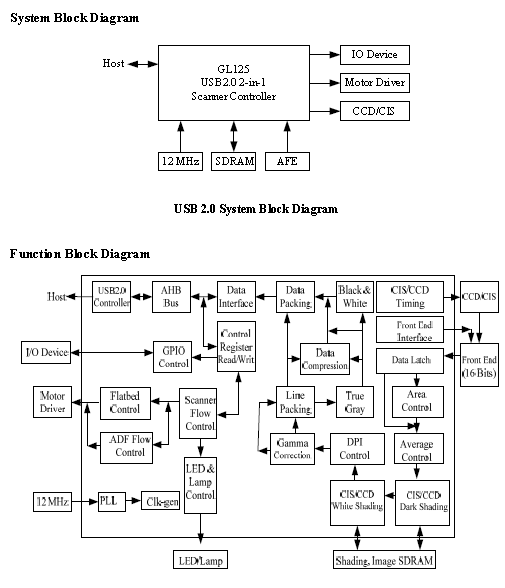 It successfully integrates scanner function ASIC and USB 2.0 interface controller into one single-chip. With its high performance design architecture, GL125 is not only ready for supporting CIS or CCD image sensors (600, 1200, 2400, 3200, 3600, 4800 and 9600dpi resolution) that are used in flatbed, transparency or sheet-fed scanners, but is able to co-work with unipolar or bipolar stepping motors. Advanced features of GL125 include five motor acceleration/ deceleration curve tables for high speed motor moving.